Youth Sunday is April 22 at all 3 worship services. Our high school youth have been hard at work planning, writing, and preparing to lead our congregation in worship. 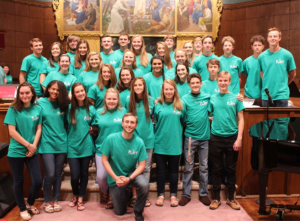 The theme that they selected for Youth Sunday this year is “Anchored in Christ”. We’ve had about 40 different high school youth involved in the planning process so far. As our youth prepare to lead worship, their primary focus is to create a unique and powerful worship experience for everyone in the congregation as they seek to lead us all in glorifying God through these worship services. We hope you can join us for worship on April 22! 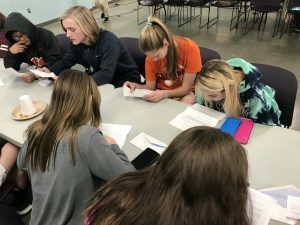 On Sunday, March 4, St. John’s high school and middle school youth participated in a hunger simulation. They were separated into households, given an income and a history, and asked to budget for their household’s food. They were asked to make sure their families were properly nourished on their budget for a week. Each month our youth groups participate in a RAK Attack Event (Random Act of Kindness.) These RAKs can be service focused or have an awareness activity that makes current day issues, like food insecurity, more easily understood by our youth. Our RAK Team put together a simulation which had the youth go through all of the channels many families in our own community must go through to feed their families. As part of the simulation, the RAK Team set up a grocery store and a food bank for the youth to shop for their food. Leaders also had the youth fill the actual 12-page SNAP application used in the state of North Carolina for Food Stamps. Based on their eligibility, some of the youth and their families were approved, and while others were denied assistance. Many of the youth found the process of dealing with food insecurity frustrating and more difficult than they anticipated, despite not actually being hungry.